By their nature, signs and billboards are intended to attract attention, including the attention of vehicle drivers. The effects of signs and billboards on safety, particularly the safety of drivers, passengers, pedestrians and cyclists, as well as the effects of these billboards on nearby residents and businesses, are valid reasons for controlling their location and size. In addition to safety, public welfare and community character are also valid reasons for regulating signs. A municipality can regulate signs visible to the public through its zoning ordinance, using reasonable and objective standards that protect the public's health, safety, welfare, and community character. Digital signs and electronic message centers (EMCs), sometimes called light-emitting diode (LED) signs, can potentially affect public safety, welfare and community character to a greater extent than other types of signs. Digital signs and EMCs are capable of displaying words, symbols, figures or images that can be electronically changed by remote or automatic means and are distinct from conventional "manual-change copy" signs that do not change their message except through physical replacement. Digital signs and EMCs have advantages over conventional manual-change copy signs because the LEDs have a longer service life, do not require on-site labor to display a new message, and offer multiple messages within the same sign area. Many advertisements can be sold using the same physical space. These signs are forms of communication that are constitutionally protected as free speech. However, municipalities have received complaints from drivers and residents because some digital signs and EMCs appear to be too bright, too large, too intrusive, and are thought to cause driver distraction. This eTool provides an overview of concepts and suggested regulations that are intended to allow digital signs and EMCs in appropriate locations while ensuring that public safety, welfare and community concerns are addressed. Provide livable and desirable neighborhood design characteristics that will maintain property values. The following limitations may be associated with design considerations for digital signs and EMCs. Applicants may find regulations and restrictions objectionable. Evaluate whether redundant numbers of signs can be combined into a single EMC, thereby reducing visual clutter. Municipalities should review the research from the American Association of State Highway and Transportation Officials (AASHTO), regarding roadside advertising and driver distraction. For example, AASHTO recommends controlling variable daytime and nighttime luminance intensities, frequency of message changes, sequential messages, animated messages, length of numbers in messages (such as telephone numbers) as well as personalized messages (which can display messages that are prompted by cellphone linkage to individual vehicles). 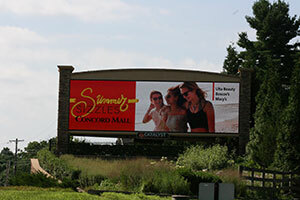 This article addresses many types of billboards, including EMCs from a conservation-oriented viewpoint. A discussion on legal issues relating to digital signs. A model sign ordinance prepared by the Montgomery County Planning Commission in 2014 provides a comprehensive approach to sign regulations by incorporating best practices from communities around the country, appropriate federal and state statutes, and provisions based on recent leading court decisions involving signage. The model sign ordinance includes regulations for both on-premises and off-premises signs. East Goshen Township regulates digital signs by limiting dwell time to 10 seconds, by prohibiting animation and requiring transition times to be less than one second. Brightness controls are required, and the display is not permitted to distract from traffic signals. West Grove Borough also regulates digital signs; dwell time is limited to a minimum of six seconds, transitions must occur within one second, no animation, scrolling, movement, fading or dissolving is permitted, automatic day/night dimming is required, and an automatic shut-off is required in case of failure (refer to Section 1803 B. of the West Grove Borough Zoning Ordinance). The Pennsylvania Municipalities Planning Code, Act 247, Sections 912.1 and 913.2, allows municipalities to add reasonable conditions and safeguards to conditional use and special exception approvals, in addition to those expressed in the zoning ordinance, as it may deem necessary to implement the purposes of the MPC and the zoning ordinance. This article from the American Planning Association explains their general policy position on billboards. An electronic sign is proposed. The posted speed limit of the adjacent roadway is 35 MPH. The sign becomes visible for drivers on the adjacent roadway at a distance of 500 feet from the sign. Determine the greatest distance the sign becomes visible: 500 feet. Multiply the road's speed limit by 5280 and then divide by 3600 (to calculate feet per second): 35 x 5280/3600 = 51.33 feet/sec. The minimum dwell time for this sign is 10.6 seconds. Source: A full discussion of dwell time can be found in the Montgomery County Model Sign Ordinance; Montgomery County Planning Commission, Appendix 2, 2014.